Good coverage of history and operations of all SAAF Squadrons, especially of WW2, Korea and Border War actions; over 800 photos. Colour illustrations of all Squadron emblems. 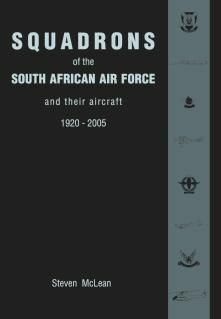 Following his successful treatise of the Spitfire in SAAF service, author Steven McLean has taken on an even more daunting task, namely a detailed history of all 62 SAAF full strength squadrons, reserve and commando squadrons, as well as the 10 training units, in 85 years of SAAF existence. This has obviously been no easy task, as conflicting opinions of what to include or exclude could readily result in a dull treatise of dates, names and locations. I am happy to say that Steven has managed this mammoth undertaking with bravura, and even though I have already spent many hours perusing this hefty tome of 464 pages, I have not yet felt the need to use it as a cure for insomnia. Indeed, I am constantly discovering new little titbits of information. 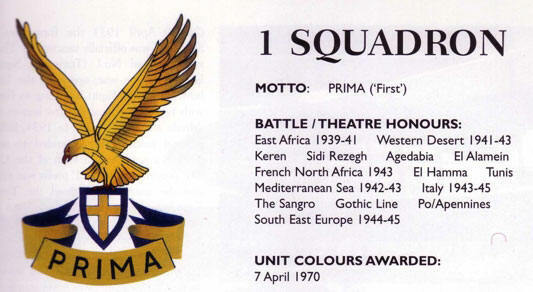 Examples of such a small personal highlight is the report that early markings used by 1 Squadron while stationed in North Africa were painted in light duck egg blue, and not white, as is so frequently assumed: the colour was just so pale that it appears white on certain black and white (orthrochromatic) films. Another titbit is a peculiarity of 1 Squadron that I (and many other fellow SAAF hobby historians) was not aware of was the use of personal nose art decorations, such as the leaping Springbok used by Lt. Stewart �Bomb� Finney on his Hurricane MKIIC. �Bomb�, incidentally wrote the preface for this book. Such items are littered throughout this book, which goes to great detail to mix a faithful record of dates and places (the SAAF moved around a lot in WW2, from Abyssinia to Italy and Austria/Germany via North Africa) the various squadrons were stationed during their lengthy combat careers, with personal anecdotes. For 2 Squadron �The Flying Cheetahs�, this covers exploits in WW2 with P-40�s and Sptfires, Korea with F-51�s and F-86�s, the drawn out �Border War� in Angola using Mirage IIIC and E�s, to the equipping with Atlas Cheetahs in the late 1980�s and current preparations for receipt of the new SAAB Gripen. The history of 3 Squadron devotes considerable space in recording the exploits of the SAAF greatest ace, Jack Frost, in considerable detail, including his daring rescue by Lt. R.H. Kershaw in a Hawker Hurricane following the crash landing of the former. The most famous South Africans, such as �Sailor Malan� and �Pat Pattle�, flew for the RAF. Of particular interest in this section on 3 Squadron is the report concerning the capture, repair and unfortunate flight (and crash) of an Italian Fiat Cr 42 complete in SAAF markings, using photos I had not seen before. Modern history of this squadron recalls its resurrection when equipped with Mirage IIIEZ fighters in the 1960�s, the subsequent acquisition of the Mirage F1CZ interceptors and the only two post WW2 Mig-21 kills by a SAAF unit (1 Mig-15 kill in Korea was never fully credited). Another item of personal interest to me, which is not widely reported, was the description of of 4 Fighter Bomber Squadron activities in the Border War, where they used their Atlas Impala MkII�s (Aermacchi MB 326K) to great effect by shooting down a half-dozen Mil-Mi 18 and Mil-Mi 25 Hind helicopters. The mix of WW2 and modern combat history makes for particularly interesting reading, as the reader gets a glimpse into how the structure and function of many squadrons changed completely over time. While several squadrons traded their fixed wing aircraft for rotors, the example of 10 Fighter Bomber Squadron is probably the most extreme as currently this unit, which flew Spitfires in WW2, is totally devoted to the use of unmanned aerials vehicles (UAV�s). History is history, war is hell no matter which side one is on, and it is refreshing to see that many of the unpleasant events are not simply glossed over. These need not only relate to loss of personnel in battle (such as the loss of numerous B-34 aircraft during attempts to supply Polish fighters in Warsaw), but also tragedies which occur by a series of errors, such as the loss in the desert of a flight of three Blenheims by 15 Bomber / Reconnaissance Squadron in the notorious Kufra incident, where all crew members perished in the desert following a navigation error. This book also contains numerous photos which will be of interest to many SAAF fans, ranging from natural metal B-26 Marauders in WW2 to a modern day 4 Squadron Impala MkI (Aermacchi MB 326) resplendent in silver finish with bright day glow red/orange markings. Colour illustrations of all squadron emblems are provided. As such, I can heartily recommend this book as a valuable resource to anybody interested in SAAF history. The book is available directly from the author at tangemere@mweb.co.za, or at www.aviationshop.co.za. In Europe the book can be ordered from: Luchtvaard Hobby Shop in Amsterdam www.lhshop.nl. Note that only 600 copies have been printed, which are selling out fast.